Michael Pollan is a great food writer. In his previous three books he enlightened me and changed my attitude towards food and the food industry. He got me started on the road to eating food that my grandparents would have recognised as food (avoiding today’s cornucopia of processed foods when possible) and to worrying about the way food is mass-produced and animals are mistreated. His fourth book, ‘Cooked’ continues some of these themes but from a slightly different angle. He looks at foods corresponding to the four classical elements: fire, water, air and earth. For ‘fire’, he chooses traditional barbecue of hogs in the Deep South. For ‘water’, he looks at meals cooked in a pot. ‘Air’ is bread, and ‘earth’ is foods relying on the action of microorganisms (e.g. fermentation to make alcohol or acidification to make cheese). It’s an interesting and enjoyable book. A rambling, meandering, thoughtful piece about what food means to us as humans. But, unlike his other work, it doesn't really have one central point or idea that he’s trying to prove. For this reason, it comes over as being slightly contrived and a bit aimless. You can’t help thinking that Pollan needed to write another book and was a bit stuck for a central idea, and then he thought about the four elements and that was good enough. The result is a Sunday Supplement magazine article that stimulates your appetite, but doesn't really bite like his earlier works. But it’s a best seller, so what do I know? In any case, it’s good enough to deserve a listen, so go ahead. As a long-time foodie, home chef, and serial do-it-yourselfer, I greatly enjoyed Michael Pollan's treatise on food alchemy. The story is engaging, I learned a few new things, and Pollan does an excellent job of narrating in a natural, conversational tone. I only listen to audiobooks during my long commute, and I found myself anxious to get back on the road so I could listen to it some more. If you're passionate about food and cooking, you won't be disappointed! I found this book to be fascinating. Masterfully blending biology, chemistry, politics, history, health and culture (pun intended) Micheal Pollan bakes an airy loaf of wisdom that's also entertaining. Cooked is about how we humans interact with our food. It's something we all do but unless you're a professional foodie something we seldom think about. 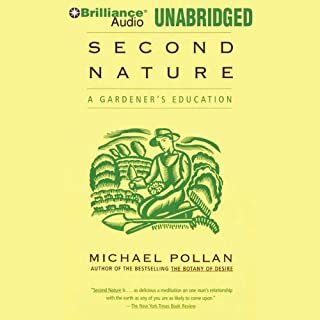 I highly recommend this read and especially this audio version read by Pollan. Michael Pollan Fans Will Love It. Great book. Michael Pollan fans will love it. BUT, in the past, his books were narrated by Scott Brick, who is fantastic. I wish the author didn't narrate the audiobook. For curious cooks . . . 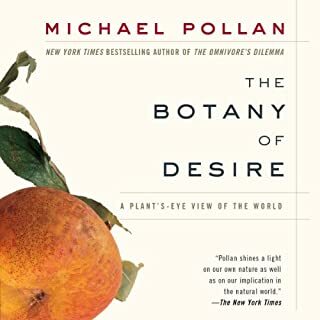 This book was not as transformative a listen as Botany of Desire, but I really enjoyed it and found myself talking about it a lot with friends. (always a good sign) It made me want to get into my kitchen on a weekend and experiment with long-ago clipped recipes. Very enjoyable. I am enjoying this book so much I decided to write a review before I finished. I usually am skeptical of author-narrated books since they don't always compare well with professionally narrated audios. This is definitely not the case with COOKED. I like the author's narration very much, he reads at a perfect speed, his voice is pleasant and he sounds like he knows what he's talking about. There's an aspect of direct communication and connection that really adds a lot to the audio. Further, this is such a fascinating exploration of food and the history of cooking that I cannot stop listening and re-listening to some parts of the book a second time. I really like the way Pollan approaches his topics, illustrating his points through experiences with individuals who are experts at doing the kind of cooking he is studying and scientific studies on different chemical reactions that take place during cooking. I also enjoy the historical perspective. I am almost halfway through the book and well into the chapter on water, or pot-cooking after having very much appreciated both the introduction and the section on cooking with fire. One of my favorite ways to listen to audiobooks is when I am cooking, which makes listening to this particular audiobook especially nice. Highly recommended read for anyone who loves to cook, loves to eat, or is interested in the role of cooking in human history. First off, I'm a total Michael Pollan fan. I first read "Food Rules" many years ago, which made so much sense that it became the springboard for my becoming vegan, a lifestyle that has lasted and lasted. Each and every one of his books has rekindled my commitment to stay away from processed foods and the other over-manufactured foods on the grocery shelves. "Cooked" takes the next step. Pollan uses the four elements (earth, air, fire, and water) to show us the delights of home cooking and the benefits therein. While I don't eat meat, I still enjoyed his adventures thru barbeque and braising (without any desire to try the foods he cooked), but it was his adventures into bread baking and fermentation that really spurred my imagination. Pollan, a polished and award winning writer, takes the under-recognized elements of food and nutrition and makes them mystical. For example, the intricate interplay of microbes used in bread baking become characters in the drama of the baked loaf. He has an understanding of the interrelationship between food and society that made me sit back and sigh. Yes, it's all so clear now. This is a very special book ... a perfect companion to Michael Moss' "Salt Sugar Fat." We can turn the current health crisis around if we listen to these sages of food. 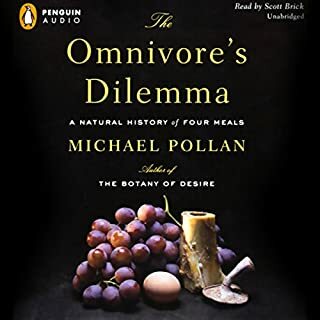 Botany of Desire made me think about our close relationship to food and Omnivore's Dilemma was laid out so we could follow an entire meal from garden or farm to the table. In this book Michael plots the history of cooking from its primitive inception to the present. We learn that it is cooking that truly separates us from animals. He goes through barbeque, boiling, fermenting and distilling. Michael makes us think we should all go out and try our hands at some old fashion craft like baking bread or brewing beer for the sheer joy of making something we have come to expect prepackaged at the supermarket. I also happen to agree with Michael that Americans seem to want to watch cooking shows,but not to engage in cooking. This summer I suggested my friends and I cook something at home. It seemed to me like people want to go out just for the opportunity to all eat something different. I love the idea of sharing different techniques and personal feeling I get from eating a friends food or seeing what they think of my creations. America's kitchen all seems to come from a box or a can. Now that I live in China I have tried my hand at things like hummus or soup. We don't have Campbell's here. This is another great work, but I still feel like Omnivore's Dilemma was his best. It made me think about how industrialize food has become.As our time strapped world wants everything in an instant; we become a world that loses appreciation for the preparation of wholesome and delicious food and the skills to bring out its inherent flavor. I actually listened to this last year, but am only now getting around to reviewing it. So, let's just say I was letting this review pickle. In Cooked Michael Pollan stays close to his food roots. 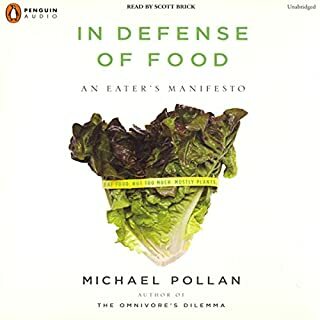 Similar in theme to: Omnivore's Dilema (Four Meals), In Defense of Food (Food Manifesto), Botany of Desire (Four Plants), Food Rules (Owner's Manual for Food), and Second Nature (Growing Food). Cooked is just another branch on the Phylogenetic food tree for the Pollan's Omnivore, me thinks. Unless, of course, Pollan is going to delve into the proper way to digest, poop, or compost your waste. And... he might just. I am neither a Pollan lover or hater. I've read a bunch of his stuff because it is fast and rather tasty. The problem with Pollan is reading too much of him. His books are a bit full of roughage and eventually too much of his raw idealism or fiber-rich localism gets to you. I think that is the problem with idealists and their genius (genus?). No one can quite live upto the expectations. There just isn't that many locally grown mushrooms, or farmer's markets, or grass-fed organic beef. But education about farming, feasting, and cooking gives us a better sense of both the idea and the real. As long as we are aware of the costs of the way we eat and the way we cook, we are better than we started. The probelm comes in when we believe ALL the hype. As long as you can remain pragmatic about food and Pollan, reading him is a good thing. What did you love best about Cooked? I loved the description of slow roasting pork and the love of the process of fermentation in pickles, beer and baking. This book inspired me to make some mead, for which I am very grateful, thank you, Michael. 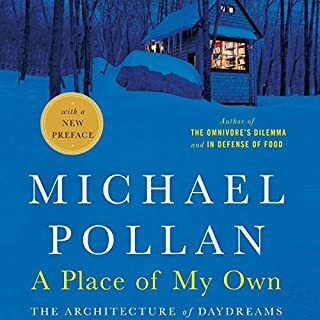 I generally love Michael's work and enjoyed this book as I expected I would but I am already a food and brewing aficionado so I already know how to brew, bake, ferment and roast, but not to the same extremes. I do not like finicky, faddish cooking so I was relieved to see how Michael focused on the real aspects of real, good, life-giving food. For anyone who is wanting to go on a gastronomical journey throughout their lives with understanding and intention, this is probably an excellent place to start. 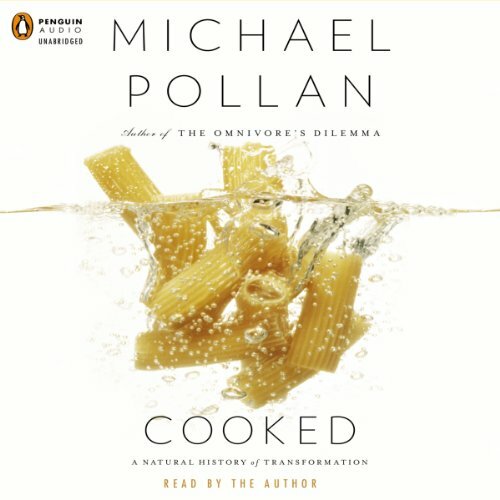 Pollan did a great job writing and narrating "Cooked" and I would recommend this to anyone looking to learn about the more philosophical side of food! 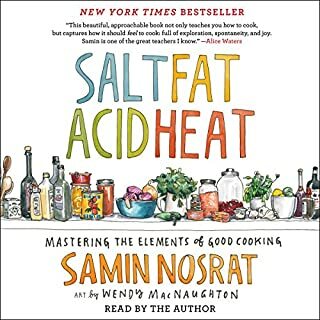 A great book for everyone, not just those interested in cooking. Michael is extremely talented writer (and researcher). I think I will come back to this book again. There is so much content that one read is not enough. Michal Pollan's Omnivores Dilemma and Cooked are entertaining and informal. I'd love to see more books of him on Audible. Reading these well researched thoughts has awoken a passion and true appreciation for preparing and consuming good quality healthy home made food, like grandma used to make. Michael Pollan kicked my passion for cooking and life up a few more notches. Bam!